Summary: For those new to facilitating teacher-research, this article provides insight into the process, specifically how teachers approach research, the potential for research to change teaching practice, and implications for teacher education. 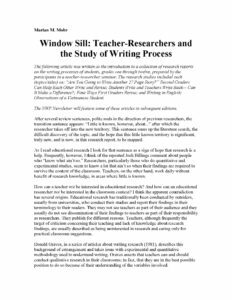 It’s written as an introduction to a collection of research reports on the writing processes of students, grades one through twelve, and prepared by the participants in a teacher-researcher seminar. Writing honestly about classroom problems, failures as well as successes, in a supportive atmosphere led to more self assurance and encouragement to change. The research logs, written under stress as they often were, in minutes between classes or during the times when the students themselves were writing, were honest writings, harsh sometimes, despairing sometimes. These writings and their authors were accepted by the other teachers and many found they shared the same problems. Teachers who avoided difficult questions about their teaching, who tried to avoid sharing their writings, were pulled up short by the other teachers in their response group. They would say to each other, “Maybe something else is going on. Have you thought about…?” Being honest with themselves and with each other seemed to enable them to change. It was a difficult triple whammy—observing, writing, and analyzing what happened in their classes—a strain, as it was repeatedly described. It was also liberating.